January 15, 2019 4:29 pm. 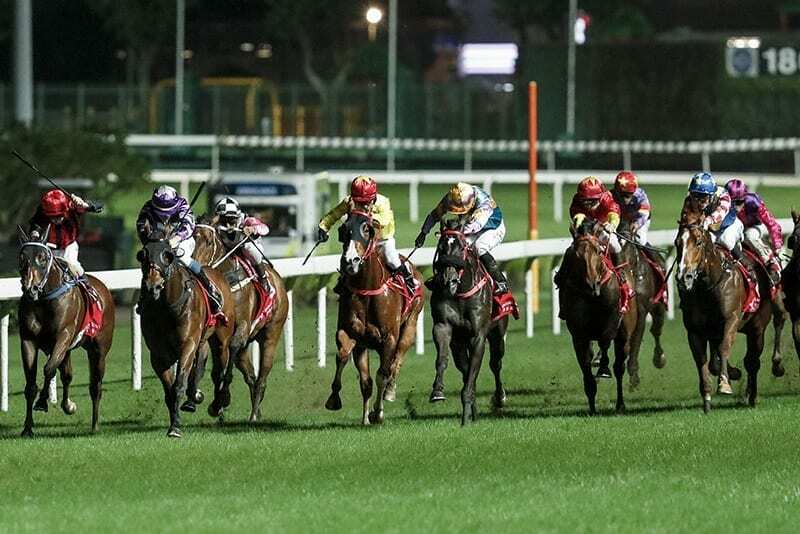 Wednesday (16 January) night’s card at Happy Valley could be viewed as the calm before a Group 1 storm, but the city track serves up several notable storylines before Beauty Generation and Mr Stunning top the bill in the Stewards’ Cup and the Centenary Sprint Cup at Sha Tin this Sunday. Caspar Fownes and Zac Purton combine in five of the eight races and the quintet all head across town with solid form claims. Silvestre de Sousa will have his skills tested as impressive recent Valley winner Happy Dragon bids to defy stall 12 in the Sports Road Handicap (1650m). Neil Callan is looking forward to being reunited with Harrier Jet as Paul O’Sullivan’s gelding jumps from the inside gate in division two of the Wong Nai Chung Handicap (1200m). And the importance of the Hong Kong Jockey Club’s Conghua base will be showcased as the Fownes-trained Seven Heavens and John Size’s Gamechangers clash in division one of the same contest. Wednesday’s fixture is the second in a row to attract 17 declared starters trained in Conghua and Zac Purton feels a six-week spell in quieter surroundings could prove valuable for Seven Heavens (133lb). The Frankel gelding has taken a while to reproduce his smart British form but took a step in the right direction when second over the course and distance on his latest start and two trial ‘wins’ at Conghua have been gained in commanding last-to-first fashion. “The Frankel horses are very highly-strung so maybe the environment at Conghua allows him to relax,” Purton said. “Seven Heavens is very quirky – he can over-race and hang in – but if he’s not doing as much in the morning he can save all his energy for race day. Gamechangers (123lb) has been based at Conghua since mid-November and looms as one of the main dangers to Seven Heavens after an unlucky run at Sha Tin. Seven rivals passed the post ahead of the Canford Cliffs gelding on New Year’s Day but the bare result does him no justice. Gamechangers gave the impression he might have gone close had he not been trapped in a pocket in the home straight that day and has Joao Moreira aboard again as he bids to win his first Hong Kong race at the 16th attempt. Fresh from a sparkling treble at Sha Tin on Saturday, de Sousa is looking forward to getting back aboard Happy Dragon (129lb) but is mindful of a the twin threats of a wide draw and the bang-in-form Green Luck (132lb) in the evening’s finale. Happy Dragon clicked at the first time of asking for de Sousa over course and distance last month, powering clear of Bank On Red (121lb) with Warm The Voice (123lb), Nitro Express (116lb), Relentless Me (119lb) and Acclaimed Light (113lb) among those further back. That quartet all re-oppose on better terms but de Sousa, having chosen to stick with John Moore’s gelding ahead of fellow course and distance scorer Starlit Knight, is more concerned with how the race could pan out from his outside gate. “I wish I was drawn lower to be honest,” he said. “If they slow down and you get caught wide at Happy Valley the race can be over and Happy Dragon is a bit tricky and everything needs to go his way. Purton poses one of the main dangers to another success for Happy Dragon aboard the progressive Green Luck, an impressive winner at the Valley two starts ago before finishing a clear second at Sha Tin. Callan is back aboard Harrier Jet (129lb) for the first time this season and feels that Paul O’Sullivan’s gelding has plenty in his favour from stall one in a race where Prince Harmony (124lb), Little Bird (133lb) and Blitzing (121lb) promise to set a demanding pace. “I had a good record on Harrier Jet towards the back end of last season and he’s getting back towards that rating and showing a glimpse of form again,” the Irishman said.